You can earn 51 Club VM Points on this product! Are you a Twisted Tornado Crimp® Pro? You need the Twisted Tornado Crimp® PRO-PAK ULTRAPLATE®! 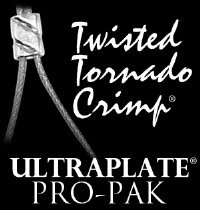 Save an additional 20% when you purchase a Twisted Tornado Crimp ® PRO-PAK ULTRAPLATE®. The Twisted Tornado Crimp® PRO-PAK ULTRAPLATE® is a full package of .019 and .024 99.9% Pure Silver ULTRAPLATE®, 019 and .024 24kt. Gold ULTRAPLATE® Twisted Tornado Crimps® . Each package consists of 50 pieces for a total of 200 pieces. How do you use the product? : This crimp is the best on the market, I discovered them at a Bead Show years ago and will never use anything but Twisted Tornado Crimp it makes beading so much easier and you don't have to worry about your projects falling apart. I would really advise anyone new to beading to give this crimp a try, you will never use anything else! "Twisted Tornado Crimp® Pro-Pak ULTRAPLATE®"
How do you use the product? : The Twisted Tornado Crimp has worked great to hold beading cord secure. I won't worry that the necklaces and bracelets will come apart. How do you use the product? : I used them to attach clasps & to string almost all of my necklaces and bracelets that I make & sell.